Once peace was made, life slowed down considerably in the outlying area that was the Flint Hill/Parkside area; still 4-and-a-half miles north of the action of the village of Buffalo. And plenty of action there was. 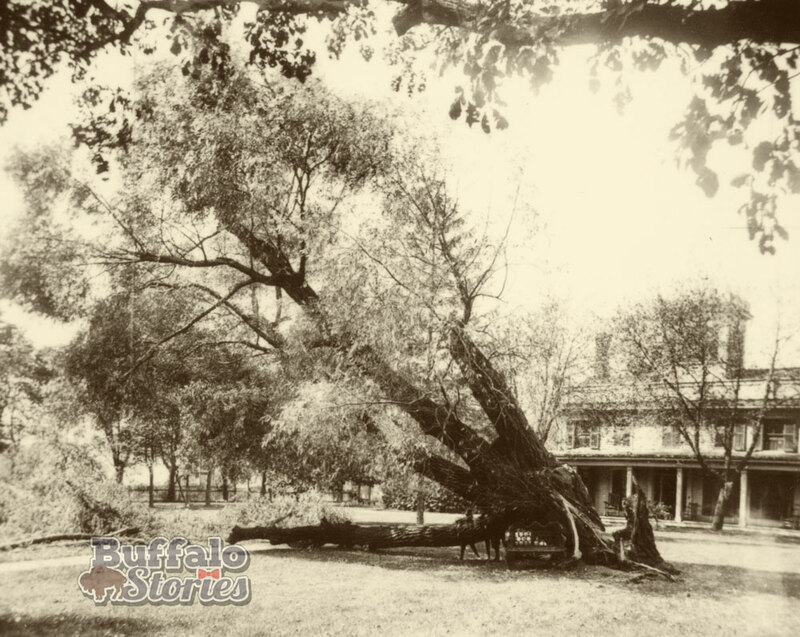 Through much political wrangling, the Village of Buffalo was selected as the terminus of the Erie Canal in 1825, bypassing the village of Black Rock, and sealing Buffalo’s fate as a major player in trade for the next century. Just as today, it was thought one way to solve the city’s problems was through taxes. The collection of tolls paid for the improvements to the Buffalo-Williamsville Road; dozens of toll gates were erected from Buffalo to Albany long the stretch, including one adjacent to Schardt’s tavern at Main and Steele Streets. 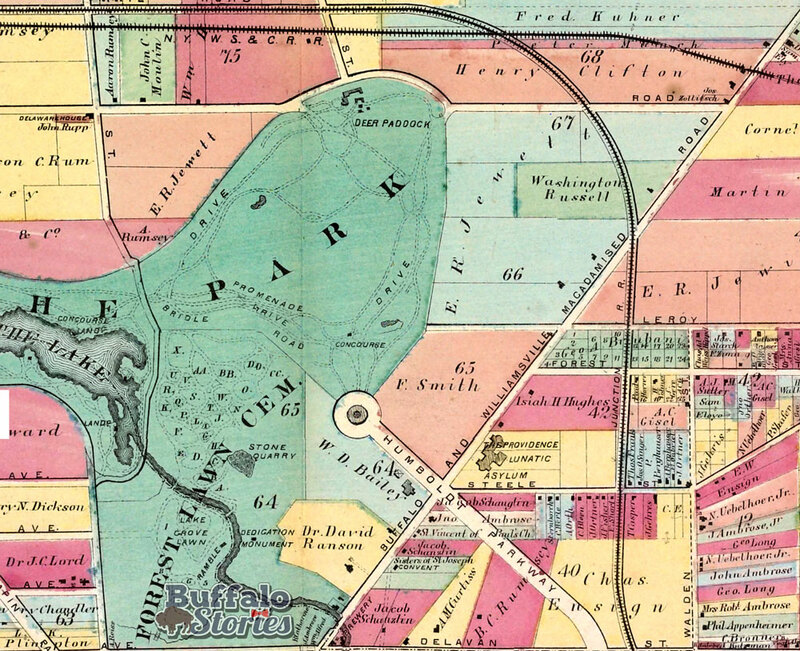 Steele was later to be renamed Kensington Avenue, and later Humboldt Parkway would cut through the corner, meaning Buffalo’s first toll booth was roughly at the corner of what is now Main and Humboldt. 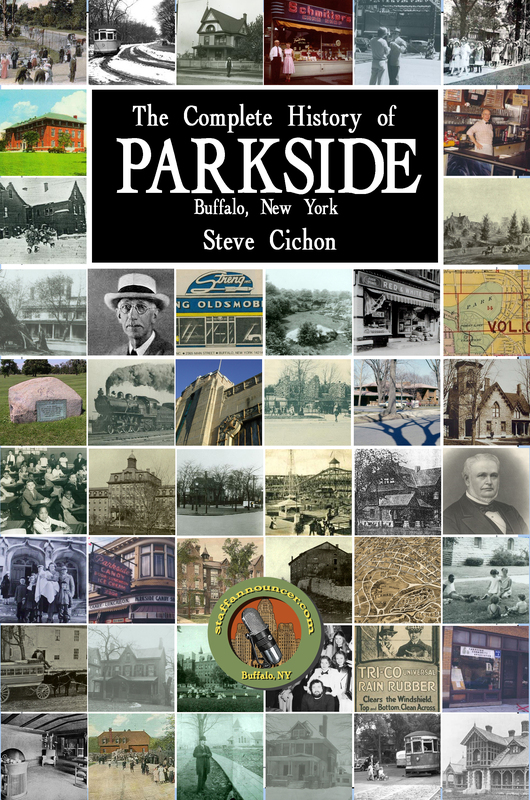 Many of the men who first came to occupy what is now Parkside were well into middle age when they came here in the first decade of the 1800s. Therefore, by the 1820s and 1830s, many of the original pioneers were giving way to a new generation, many of whom knew Flint Hill and the Buffalo Plains as their only home. Judge Erastus Granger would retire most of his public offices, and live out his final years at Flint Hill; his 700 acres scattered with homes for friends and family members. He remained a firm Republican, and a close friend of New York Governor DeWitt Clinton. He was one of many Buffalonians who pushed for the building of the Erie Canal, and pushed for its western terminus to be located in Buffalo. His friendship with Red Jacket also grew. Granger was buried on Christmas Day, 1826. Following the funeral, as the casket was about to be lowered into the grave, Red Jacket stood forward, and stared intently upon the face of the deceased. The great Indian Chief then delivered in his native Seneca tongue a final eulogy and prayer for his close friend. Those who heard it and understood it, said it was one of Red Jacket’s finest oratories, in a career of fine oratory. 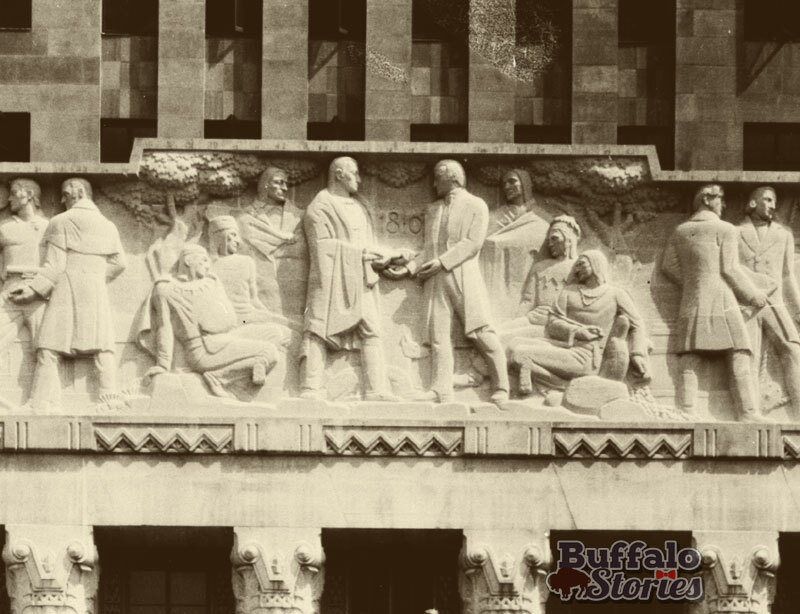 The men’s friendship was legendary enough to be etched on the façade of City Hall. In 1845, Erastus’s son Warren Granger built for himself a great stone mansion on the site of the ancient Councils in the Oaks of the Senecas. Again, this place is now marked at Forest Lawn Cemetery by a large sundial, easily visible from Main Street. The Gothic Structure was designed by Calvin Otis, built by John Ambrose, and made of stone quarried from the estate. 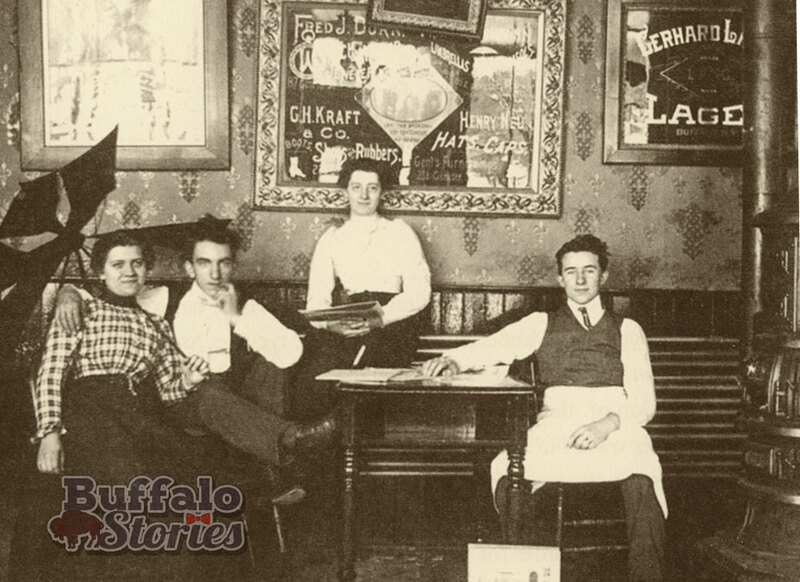 It was destined to become the center of the Buffalo social scene, despite it’s out of the way location. Like his father before him, Warren was a staunch Republican. His home saw parties during the Hard Cider campaign of William Henry Harrison, and actually played host to then-former President John Quincy Adams in 1848. And there is scarcely a doubt that Granger was in attendance when Abraham Lincoln stopped in Buffalo in February 1861 on his way to Washington to take the oath of office as President. 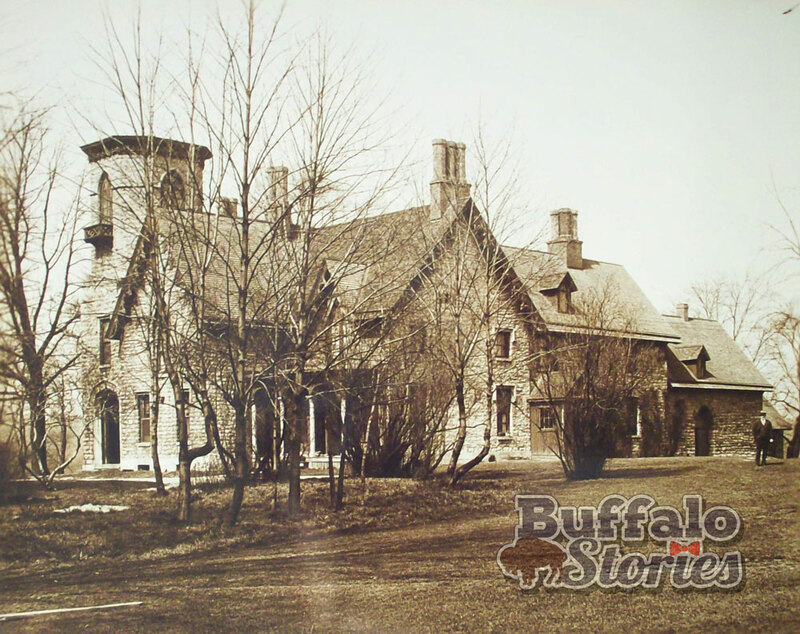 The Granger’s property was considered among the most beautiful on the Niagara Frontier, and, in 1850, the Granger Family sold most of its vast tracts of rolling green acreage to the City of Buffalo. Some of it, 80 acres worth, was destined to become Forest Lawn Cemetery. But the rest of the land, including Granger’s quarry and his meadow, would be reserved by the City for future use as a park. It would be over a quarter of a century, however, before Frederick Law Olmsted would unveil plans to transform the areas raw, natural beauty into the Delaware Park we know today. Captain Rowland Cotton was one of the original Plains Rangers, and was the Revolutionary War veteran who helped Daniel Chapin exhume and re-inter the 300 souls who died at the Flint Hill camp in 1813. He moved to the village of Lancaster in 1826, and as those Parksiders who live between Jewett Parkway and Russell Avenue will note on their property deeds, Cotton sold his farm to Washington Adams Russell. Russell was the son of James Russell, a Revolutionary War Captain who happened to be well acquainted with the Commander-In-Chief of the Continental Army, George Washington. When Russell’s son was born in 1801, he named him after the first two Presidents of the United States—George Washington and John Adams. Washington Adams Russell left central Pennsylvania in 1825 with his young family, driving a team of oxen towards Buffalo. He ran the Cold Springs Tavern at what is now Main and Ferry Streets for a year, before buying the 200-acre Cotton estate. 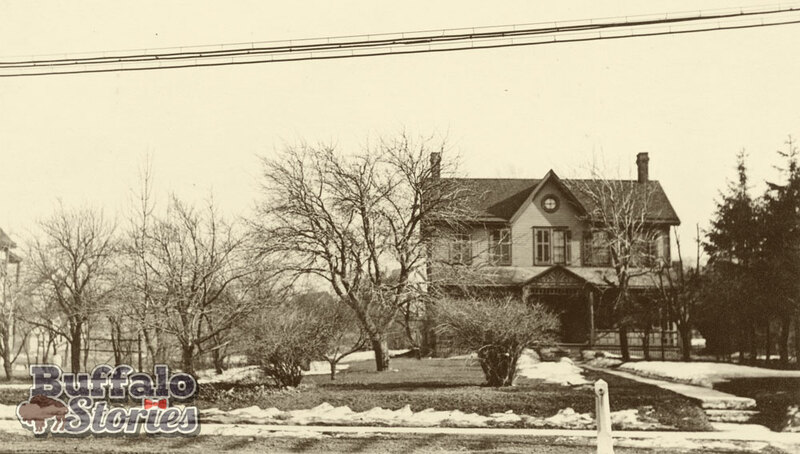 In 1841, he built the area’s first brick home, a home which still stands today at 2540 Main Street (seen below in the 1880s). Now painted white, the building houses “The Church in Buffalo,” marked today by a sign proclaiming “Taste and See!” on the Main Street lawn. But for years, it was the McKendry-Dengler then Roberts-Dengler Funeral Home. It remains the oldest home still standing in Parkside. Washington Adams Russell died in the home in 1877, but his name lived on famously in Parkside. Russell’s son Washington Russell II went to California during the Gold Rush of 1849. His grandson, Washington Russell III was another prominent figure in local history, famous as an eccentric renaissance man. Aside from having built the oldest building still in Parkside, the eldest Russell is also remembered as having been the source of four street names in Parkside. Deeded to the city in 1889, Russell Avenue was the cow path by which the family brought their cattle to drink from a spring in the Delaware Park meadow. Fairfield and Greenfield were the names of pastures on the Russell farm, located about where those streets are today. Orchard Place was the site of the Russell fruit tree orchard. Col. William Whitney Chapin stayed on at his father Dr. Daniel Chapin’s home on Main Street following the doctor’s death in 1821. Over the years, William built out from the somewhat rustic frontier cabin his father called home, eventually enveloping it completely. In doing so, with an eye towards aesthetics, he’d built what was considered one of Buffalo’s most beautiful mansions. Willowlawn, he named it, for the willow trees surrounding the home. It was from one of these trees that Daniel Chapin took clippings to plant on either side of the grave in the Park Meadow. It is also from this estate that Willow Lawn, the small street between Crescent Avenue and Main Street, takes its name. Before Willowlawn Avenue was deeded to the city in 1905, it was the site of an expansive garden just to the south of the home. 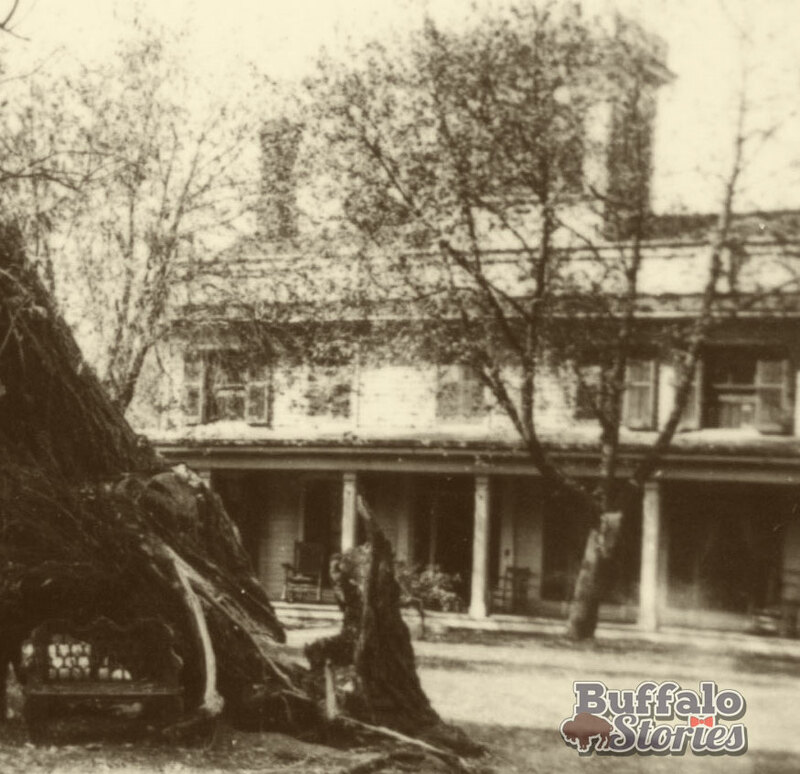 The Willowlawn Estate, as it appeared in 1901 after a great storm which toppled a willow on the front lawn. An apartment complex now stands at the site, at Main & Jewett. Col. Chapin died in 1852. Eight years later, in 1864, Elam Jewett, the publisher of Buffalo newspaper The Commercial Advertiser, purchased the Willowlawn Estate. It was Jewett’s wealth, philanthropy, and keen eye as a developer that would help change the serene Buffalo Plains and Flint Hill area into the Parkside known today. Elam Jewett was raised on his father’s farm in Vermont, and wrote for several newspapers in that state. 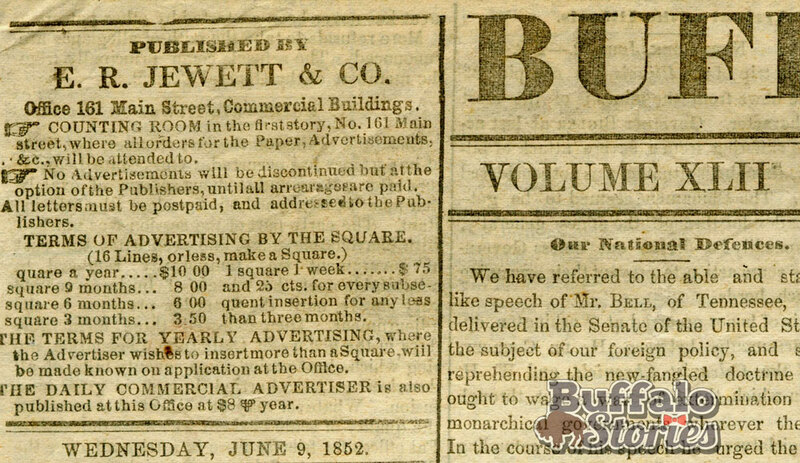 He grew restless however, and looked to the western frontier, “where great opportunities awaited him.” He purchased a newspaper, The Buffalo Journal from Judge Samuel Wilkeson in 1838, and merged it with the Advertiser the next year. Having become a prominent Buffalonian in his own right, Jewett became a close friend of another prominent Buffalonian– Millard Fillmore. The two traveled in Europe together in 1856. Jewett had “retired” to Willow-lawn to live the life of a “gentle-man farmer” on the massive acreage, but he did have several publicly-minded plans for his sprawling property. First, with the War of 1812 still fresh in the minds of Buffalo, Jewett wanted to build a proper stone memorial to the hundreds buried in what was essentially now his backyard by Dr. Chapin and Captain Cotton. The Mound in The Meadow didn’t look much different than it did 40 years earlier when the 300 soldiers were buried the spring following that “dreadful contagion” in 1813. It remained marked only by the pair of willow trees planted by Dr. Chapin, though the saplings had grown to full mature trees marking either side of the ghoulish reminder of the area’s war history. But it was ultimately through Dr. Chapin’s previously mentioned efforts to keep and enhance the area’s natural beauty that Mr. Jewett’s patriotic intentions to build the monument were frustrated. The city took that majestic part of Jewett’s land, and added it to the land also purchased from the Granger family, to make up the bulk of what is now Delaware Park. The mass grave remains to this day, underneath the Delaware Park Golf course, marked only by a large boulder placed by the Historical Society in 1896. The wealthy publishing magnate also planned to give to his church in his retirement. 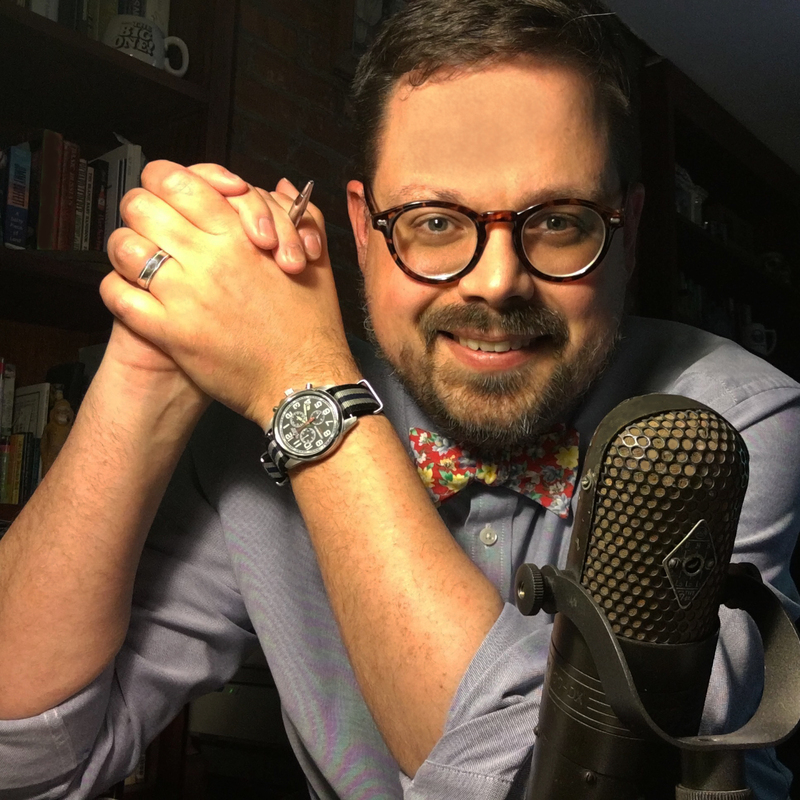 Though his various plans were frustrated and also met with stops and starts through the years, Jewett eventually created a church that became the center from which the Parkside neighborhood would be built. This 1872 map shows Elam Jewett’s vast property holdings, on both sides of the park, and both sides of Main Street.